Your smile is an invaluable asset to your confidence and how others view you. Unfortunately, not everyone is pleased with the way their teeth look. If you are among those who hide their mouth, you can get the radiant smile you want with direct bonding. The simple, effective treatment can significantly improve your teeth in as little as one appointment. 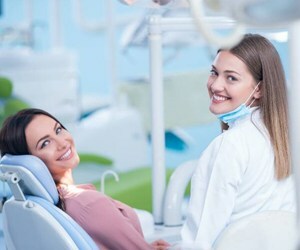 At Antoon Family Dental, we can create a smile you will want to show off. Direct bonding is a cosmetic procedure used to enhance the color, size, shape, and proportion of the teeth using a composite resin material. The resin is customizable to match the color of your enamel to blend in seamlessly when you smile for natural-looking results. Although it is often used to improve the appearance of the teeth, it also offers certain restorative benefits as well. Tooth bonding can also be used as an alternative to traditional amalgam fillings to treat cavities. You are scheduled for your appointment after your initial consultation. Your dentist first cleans your teeth and applies a weak acid to the tooth to be treated. This opens its pores to encourage a secure bond between the resin and the tooth. The acid is rinsed from your tooth and it is dried. Your dentist uses a color guide to find the perfect shade for the resin. It is applied to your tooth and sculpted into the ideal shape. A special light is used to quickly harden the material. Your tooth is filed and polished, so you will walk out with a flawless smile. The quick treatment offers noticeable results with minimal discomfort. In fact, you may not even need an anesthetic. On average, you can expect it to take 30 to 60 minutes per tooth. Brush your teeth twice a day using a soft-bristled toothbrush and nonabrasive toothpaste. Avoid consuming darkly pigmented foods and drinks to prevent stains. Do not bite overly hard foods, like ice. You do not need to hide behind flawed teeth. You can get the radiant smile you crave with direct bonding. Contact our office today to schedule your consultation.